Entertainment Weekly has gathered some wacky and wild tweets from writers on the maddening things people say to them about writing. Joanne Harris, author of Chocolat, kicked off the trend when her hashtag #TenThingsNotToSayToAWriter caused a hilarious uproar on literary Twitterverse, July 28, 2015, with other writers following up with their own funny and awful things they've been told. Eye surgeon: I'm thinking of writing a novel! Me: Cool, I'm thinking of doing eye surgery! #TenThingsNotToSayToAWriter CUSTOMER HANDING ME 5 BOOKS TO SIGN. "It was great. I got all of them for a dollar! No one else wanted them." Feel free to share your own humorous #TenThingsNotToSayToAWriter both on Twitter and in my comments section below. Hope you enjoyed this post! To be notified of future updates, use the subscription options on the right side bar. Writers often shell out lots of money to enter literary contests and submit to magazines, but is it worth the expense? 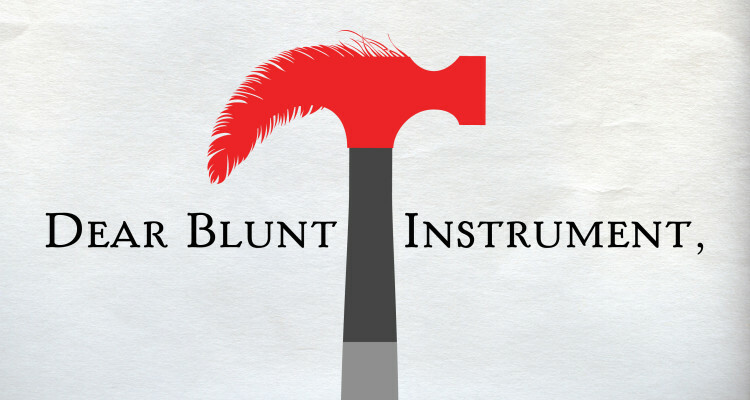 The Blunt Instrument has a very helpful article by Elisa Gabbert on how writers can make the decision whether or not to spend the $25 or more that contests often cost. It also clues writers in on what their options are if they choose to not bother with contests. Stop by Electric Lit to read the article and learn more.